The recent storms and high tides have dumped a veritable bounty of ‘rubbish’ on the high tide line at Longrock, our nearest dog-walking beach. Evidence of casualties litter the sand, not only birds feathers and fish carcasses but I also counted at least 8 odd shoes washed up in a short span of beach alone and wondered where they had come from and what their stories were. True to form, rather than gathering up a few sacks of the washed up seaweed newly ripped from the sea floor to put on the allotment (which is what I should have been doing), I adopted bag-lady mode and filled a few doggy bagfulls of the most colourfull bits of rope, twine, cans and plastic tops etc, that I could find….glorious! I dare say bemused onlookers thought I was doing my good deed for the day by cleaning up the beach. Not so, I’m afraid! These doggy bags, for once, were not destined for the municipal bin. With my stash safely spirited away in my studio, I’ve begun to hatch a plan to get these colourful ‘discards’ actually incorporated into a new series of paintings. 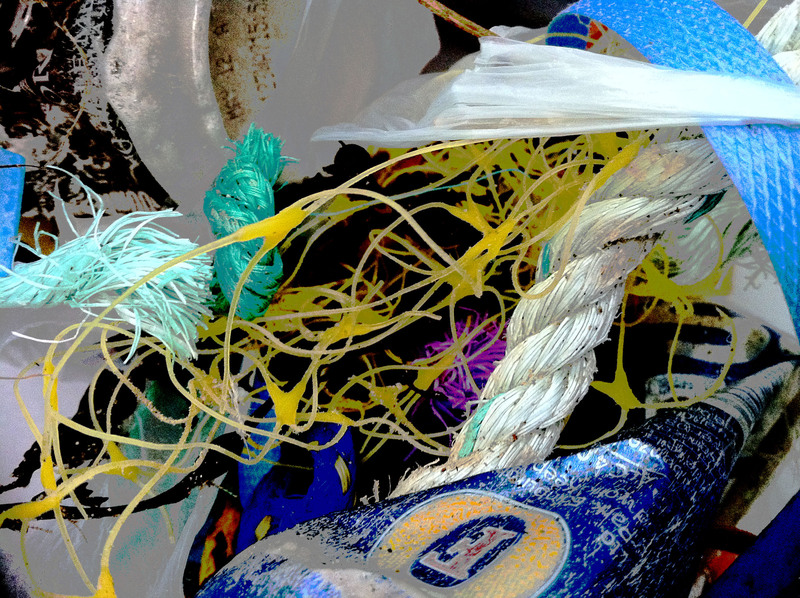 Mm….what shall I call it…..Tarred and Feathered…Storm-Tossed Tide Line…..True Colours? Any ideas?